Enjoy sumptuous fragrance with this London perfumed ball from Ladurée. A wonderfully simplistic black ball, it is held by a beautiful grosgrain ribbon and is perfumed with intense notes of leather and wax. Presented in a unique geometric gift box, it takes inspiration from the silk fabrics of elegant gentleman and makes a wonderful unique gift idea. 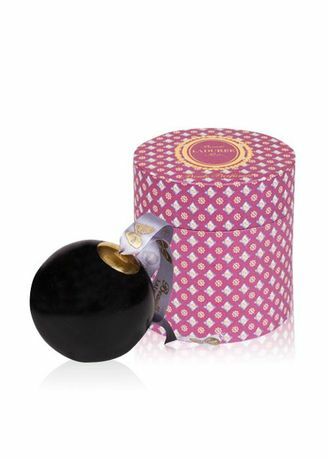 This Ladurée wax ball will delicately perfume your home or wardrobe. A highly perfumed ball of wax, held by a beautiful grosgrain ribbon in the colors of Ladurée, releases intense and delicate perfumed notes. These refined decorations object can be used in suspension or placed on a support or simply in a silk paper. Intense and precious, the extreme perfume inside the ball will last for a long time and slowly spread its delicate fragrance. These perfumed balls are made from a custom made mold and polished by hand, the ribbon is introduced by hand as well as the metallic parts (plated brass, gold or silver). They feature a new bespoke wax composition to diffuse the scent without combustion. The ball weighs 200g and contains 13% of perfume (high quality product with high perfume concentration). 100% made in France.